Let me know what you think about this new set of Switch reviews! VideoGameCritic wrote: Let me know what you think about this new set of Switch reviews! BTW critic, you are wrong about Namco Museum Arcade_Pak having DLC which is actually is called Namco Museum Arcade Pack as no DLC exist for this game or the two stand alone digital versions called Namco Museum and Pac Man Championship edition 2 plus. But what you are right about is the EULA problem, you can avoid online uploading scores by changing the default game settings which is recommended for you. I was hoping you'd warm up to Sky Kid at long last (One of my personal favorites), but at least you're consistent with your earlier reviews. Ms. Pac-Man for some reason has fallen out of favor in recent years. With few exceptions, it usually hasn't appeared on dedicated gaming devices when Namco delves into their back catalog over the past decade or so. I'd estimate off the top of my head that for every 5 times we've seen arcade Pac-Man appearing since say 2007 or so, Ms. Pac-Man only shows up once. Where are these default game settings you speak of? Please be specific. I will show you when I get home via the Switch screen capture feature. Atariboy wrote: I was hoping you'd warm up to Sky Kid at long last (One of my personal favorites), but at least you're consistent with your earlier reviews. Steve Golson, Ms Pac-man developer, said that's because Namco didn't want to pay him a royalty anymore. Seriously. Thanks for the reviews. I remember Toki vaguely. I remember it being fun. It is a shame to read about not having all the goodies of the ps1 releases. Namco could fit their entire back catalogue onto one cartridge. In some ways I am not surprised. Look at the shambles that was arcade pack on the xbox. 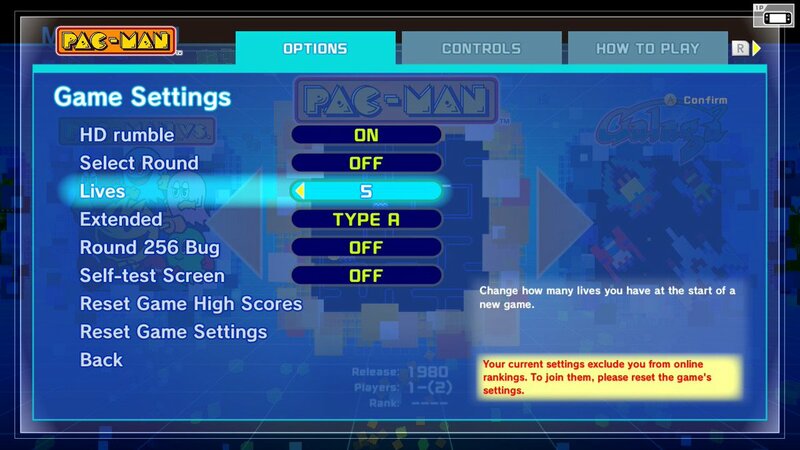 Download only Galaga, Pacman and Digdug. You had to pay extra if you wanted Ms pacman. 4 games in total. Thanks for the review. Can we have the SNK collection next on Switch? I hear that there is at least 20 games on it. Though 11 of them might be download only after you have put it on your Switch. When it default setting you get the annoying internet promp. When it changed settings like this you get rid of the annoying internet promp saying "Your current settings excluds you from online rankings. To join them, please reset the game's settings.". Cafeman wrote: Steve Golson, Ms Pac-man developer, said that's because Namco didn't want to pay him a royalty anymore. Seriously. 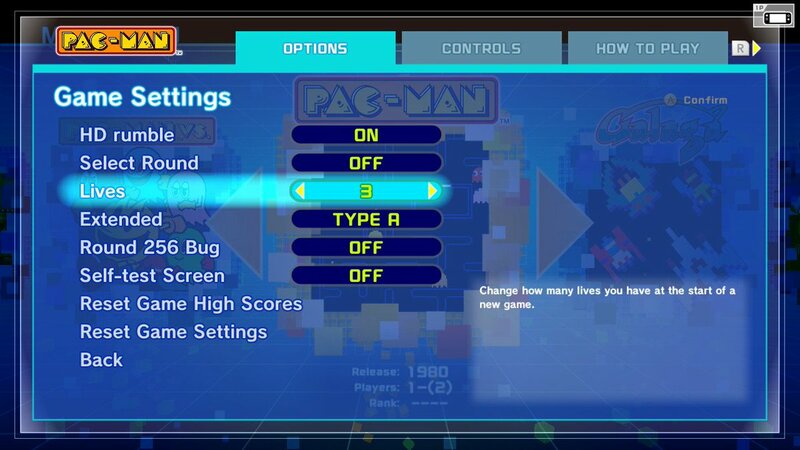 Explains why it was the lone piece of paid DLC for Pac-Man Museum on the 360/PS3. It also answers why when 'Pac-Man Championship Edition 2 + Arcade Game Series' hit retail for the PS4/XB1, Ms. Pac-Man was excluded from the arcade extras (Namco released 4 classics as standalone downloads on the PS4/XB1 including Ms. Pac-Man, and this disc included three of them).